The latest developments in spectrometry are focused on improved NMR and FT-IR devices. Sean Ottewell reports. Agilent Technologies is developing a series of new ultra-high-field nuclear magnetic resonance (NMR) spectrometers at 850 MHz and 1GHz (Fig. 1). "Agilent Technologies is committed to working closely with our customers and partners to develop next-generation NMR technology," said Nick Roelofs, president of the company's life sciences group. "The gigahertz project will leverage the company's full capabilities in magnet and probe design, electronic measurement and systems integration to deliver world class performance for researchers working to understand the structure and dynamics of macromolecules." As part of its strategy to expand NMR applications, Agilent has also entered into a co-marketing agreement with Bridge12 Technologies. Bridge12 is a provider of terahertz technology, a critical component for an emerging application known as dynamic nuclear polarisation (DNP). DNP can significantly improve measurement sensitivity for solid-state samples. The co-marketing agreement enables the commercialisation of DNP NMR systems, including Bridge12's terahertz gyrotron and transmission line system. "The Bridge12 team is very excited about the collaboration with Agilent," said Jagadishwar Sirigiri, founder. 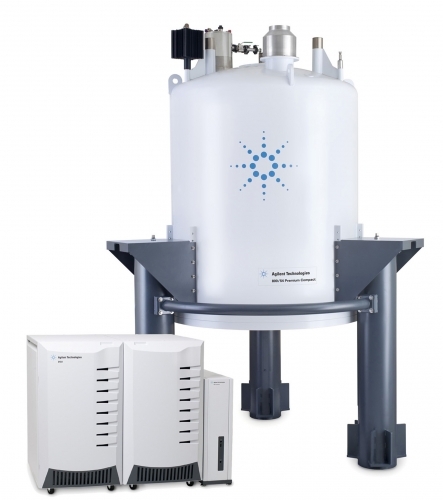 "Our gyrotrons for DNP-NMR systems are turnkey, low-maintenance, and designed specifically for the requirements of the NMR community." The Bridge 12 announcement came shortly after Agilent acquired BIOCIUS Life Sciences, developer of the RapidFire high-throughput mass spectrometry drug-screening platform for the pharmaceutical and biopharmaceutical markets. BIOCIUS says that its RapidFire drug-screening technology has successfully screened millions of compounds, providing results 10-100 times faster than traditional screening methods. Using high-throughput mass spectrometry and innovative microfluidics, the RapidFire system enables researchers to gain a fuller understanding of a drug's biochemical properties, including potential liabilities in drug interactions. "BIOCIUS' RapidFire technology gives customers an unsurpassed ability to increase the effectiveness and reduce the cost of drug discovery and compound identification," said Gustavo Salem, vice president of Agilent's biological systems division within the company's life sciences group. "With this technology and the team that developed it now part of Agilent, we can expand our reach in the pharmaceutical and clinical mass spec markets." In other NMR news, JEOL and the Innovation Network Corporation of Japan (INCJ) have formed a new joint venture company dedicated to the development of next-generation NMR instrumentation. The new spinoff, JEOL Resonance, will allow the flow of technology and expertise beyond the boundaries of existing organisational structures through a new 'open innovation' concept. A network of collaborators from research institutes, universities, and suppliers, plus an investment of Y1.5b (EUR12.3m) from INCJ is the spark for a revitalised effort in research and development of advanced NMR systems. Additional funding will come from JASTEC, the only Japanese manufacturer of superconducting magnets for NMR. NMR is used to determine the structure of molecules by analysing the specific resonance frequency of the nuclei of atoms. NMR excels in the analysis of organic compounds and macromolecules. Applications are expanding beyond the domain of pharmaceuticals, biotechnology, food and chemistry into the emerging and exponentially growing new fields of organic electro-luminescence devices, thin film batteries, and alternative energy research. This sophisticated instrumentation is comprised of several technologies including digital radio frequency (RF) engineering, superconducting magnets, and NMR probe design, such as the new ultra-fast 1mm 80 kHz magic angle spinning probe for solid state analysis recently introduced by JEOL. "We expect that by expanding R&D resources and focusing efforts towards producing the next generation of NMR spectrometers, JEOL Resonance will greatly enhance the long-standing reputation of JEOL's NMR product line," said Douglas Meinhart, director of JEOL USA Analytical Products. JEOL Resonance will also continue with development and manufacture of Electron Spin Resonance (ESR) spectrometers. PerkinElmer has launched a new high performance infrared (FT-IR) spectrometer called Frontier (Fig. 2). Part of a new family of spectrometers, the Frontier analytical platform meets diverse FT-IR challenges ranging from everyday measurements to the most advanced, complex analyses. Delivering what the company describes as unmatched respectability of transmission spectra, Frontier's sensitivity and configurability ensure better performance in demanding applications, helping to advance safe drug development, understand complex chemical and material properties, and meet the challenging requirements of research and academia. Frontier's optical flexibility enables the addition of a vast array of specialised accessories to meet a wide range of sampling challenges; whether checking for batch conformity or micro contamination. A modular and upgradeable platform combined with exceptional signal-to-noise ratio assures optimal spectral performance for near-, mid- and far- infrared spectroscopic analysis. The novel automated range changing capability allows multiple techniques to be utilised at the touch of a button, with the flexible optical system also permitting the addition of microscopy and imaging systems for detailed materials analysis. In other news, the Thermo Scientific Nicolet iS5 FT-IR spectrometer has just received a 2011 scientists' choice award for best new spectroscopy product of 2010. Thermo says the award, which was voted on by scientists, recognises the no-compromise, affordable and compact FT-IR spectroscopy capabilities of the rugged instrument. The Nicolet iS5 combines flexible sample handling with Thermo Scientific OMNIC software to deliver an FT-IR solution for manufacturers, forensic laboratories and chemistry classrooms. The instrument, which provides performance comparable to larger sized spectrometers, is used for product assurance testing, basic troubleshooting and chemistry teaching. This year, more than 35 000 members of the SelectScience.net web community were invited to nominate their favourite general lab, separations and spectroscopy products. The most popular nominated products were then voted on by scientists. The Thermo Scientific Nicolet iS5 received approximately one quarter of the votes and was selected as winner from among eight final nominations. The company says the spectrometer establishes a new benchmark in small-footprint FT-IR spectroscopy. The instrument features an open-architecture sample compartment that accepts a wide variety of sampling accessories. The award winning Thermo Scientific OMNIC software, widely adopted by major industrial manufacturers and forensic laboratories around the world, provides the spectrometer with flexibility to address many challenging applications. The Nicolet iS5 is the ideal solution for raw materials, impurities and mixtures identification, creating a novel user experience - from sample-in to answer-out. Meanwhile Andor has introduced the new iStar range of scientific-grade ICCDs. This, says the company, redefines the standard of rapid, nanosecond time-resolved imaging and spectroscopy. iStar extracts the very best from charge couple device (CCD) sensor and gated image intensifier technologies, achieving a superior combination of rapid acquisitions rates and ultra-high sensitivity down to single photon. Exceptional detection performances are accessed through high quantum-efficiency image intensifiers, thermo-electric cooling to -40°C, 500 kHz photocathode gating rates and enhanced intensifier EBI noise reduction. Low jitter, low insertion delay gating electronics and nanosecond-scale optical gating provide excellent timing accuracy down to few tens of picoseconds, allowing ultra-precise synchronisation of complex experiments through iStar's comprehensive range of input/output triggering options. Antoine Varagnat, product specialist for spectroscopy and time-resolved at Andor, said: "With the new iStar, Andor has added a new star to its portfolio of cutting-edge ICCDs, setting once again the standard for nanosecond time-resolved detection. The ultrafast new iStar platform can achieve amazing acquisition speeds of over 29,000 spectrum per second, while offering very low readout and thermal noise as well as intensifier boasting up to 50 per cent QE for unrivalled sensitivity."